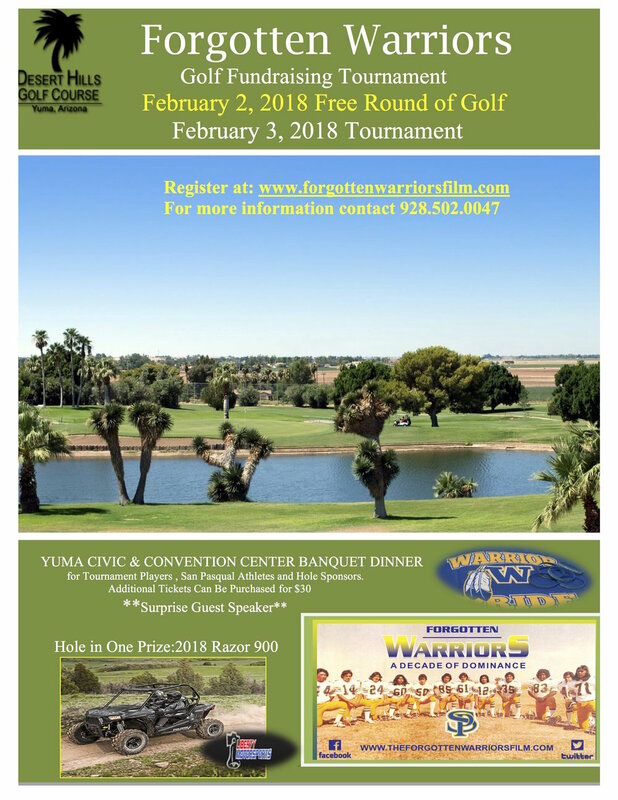 Register today to reserve your spot for the Forgotten Warriors Golf Tournament at Desert Hills Golf Course, February 3, 2018. Just fill out the registration form below, click "Submit" and send in your deposit or click the "Payment" option to pay online. It's that simple! The Forgotten Warriors Golf Tournament is a fundraiser and all proceeds will go directly to the production of the documentary film being produced about this historic football team and the attitude and spirit that changed the lives of so many player, then and now. This film production will be used to create awareness on the importance of health, both physical and mental, in Native American communities through out the country. Be sure to register today to reserve your spot and help us in our campaign to increase healthy lifestyles in our communities. We are looking forward to seeing you at the tournament. Please fill out the above form to reserve your spot on the tournament. A deposit in the amount of $50.00 for single players and $125.00 for team is required to reserve your spot. You can also pay the full amount, $125.00 single player or $500.00 team, if you prefer. A nonrefundable deposit can be paid either online or by check sent to: Forgotten Warriors LLC, 291 S Main St Ste E, Yuma AZ, 85364. Please contact us with any questions. Thank you!